In the last post, we discussed Insertion and Union of Fibonacci Heaps. 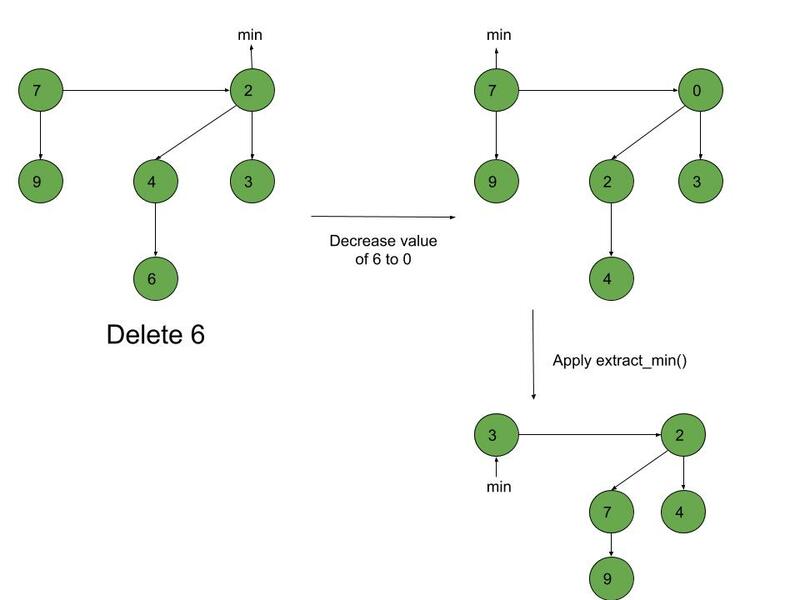 In this post, we will discuss Extract_min(), Decrease_key() and Deletion() operations on Fibonacci heap. Set head to the next min node and add all the tree of the deleted node in root list. Create an array of degree pointers of the size of the deleted node. Set degree pointer to current node. Move to the next node. If degrees are different then set degree pointer to next node. If degrees are same then join the Fibonacci trees by union operation. Repeat steps 4 and 5 until the heap is completed. Decrease the value of the node ‘x’ to the new chosen value. Update min pointer if necessary. Cut off the link between ‘x’ and its parent. Mark the parent of ‘x’. Add tree rooted at ‘x’ to the root list and update min pointer if necessary. Cut off the link between ‘x’ and its parent p[x]. Add ‘x’ to the root list, updating min pointer if necessary. Cut off link between p[x] and p[p[x]]. Add p[x] to the root list, updating min pointer if necessary. If p[p[x]] is unmarked, mark it. Else, cut off p[p[x]] and repeat steps 4.2 to 4.5, taking p[p[x]] as ‘x’. Decrease the value of the node to be deleted ‘x’ to minimum by Decrease_key() function. By using min heap property, heapify the heap containing ‘x’, bringing ‘x’ to the root list. Apply Extract_min() algorithm to the Fibonacci heap.